It goes without saying that instruments that we can purchase in every corner today, did not always exist. Just like us, they were born at some point in history and developed more and more as the time passed by. From the very day of their creation, they started leaving indelible trace, which then turned into a whole new chapter in music. Yeah, you are right, I am talking about electric guitars. Following their predecessors and taking rather different path, these innovative instruments quickly occupied every inch of the market and scraped into the rigs of numerous musicians. Today I am going to go back in time and take you with me as I explore the evolution of electric guitars (for detailed product reviews click here). During the 1920s, as the amount of big bands started rising dramatically, it became clear as a day that good ol’ acoustic instruments were not sufficient anymore. Everybody understood perfectly that some sort of amplification was needed. And the quest of designing ultimate electronic instrument began. Even though there were numerous attempts, the first electrically amplified stringed instrument was “Frying Pan”. It was developed in 1931 by George Beauchamp in collaboration with Paul Barth (the company they worked in was National Guitar Corporation). Harry Watson built the prototype of “Frying Pan”, which was a lap-steel instrument. Its name stems from its appearance: the round body has a “handle” – long neck. The commercial production of the “Frying Pan” began in 1932. Soon after, in 1934, the company was renamed Rickenbacker Electro Stringed Instrument Company. After the success of their first guitar, they created Electro-Spanish Ken Roberts later in 1930s, which was yet another revolutionary instrument. It was the first full 25” scale electric guitar, which was meant to be played vertically unlike its predecessors. It also pioneered in featuring the hand-operated vibrato as a standard appointment. Les Paul, one of the most prominent guitar virtuosos and legendary innovators, was in search of his perfect sound basically his whole life. He experimented with anything that could be used as a material for the guitar. He did not like the feedback of the guitars that existed at the time, so he did his best to eliminate this issue. And somewhere on this way, in 1941, he created the “Log”. This was a solid block of maple to which Les Paul attached strings and Gibson pick up. To improve the appearance and make it look like a guitar, he added the wings – the body of Epiphone hollow-body. The “Log” did not have feedback and could create way more sustain than hollow-bodies. And all of this was thanks to the solid electronics in the middle which did not allow the rest of the body to resonate. Bigsby Travis Guitar was born in 1947, when Merle Travis asked Paul Bigsby to fix his Kaufman vibrato unit. Bigsby took things seriously and basically created a new system. His guitar had innovative headstock with all six tuners on one side. This contributed to the further development of solid-body electric guitars. Moving on to the Fender Broadcaster (that was later renamed Telecaster due to copyright issues), this renowned guitar was the creation of Leo Fender himself. He was searching for the clear sound that would not have feedback and as a result, he brought out the first solid-body electric guitar. It had two pickups and distinctive sound that was not available before. 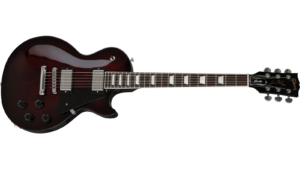 The creation of Gibson Les Paul was subsequent to the collaboration between Gibson and Les Paul. Even though the brand initially turned down the musician’s offer and called the “Log” “a broomstick with a pick up on it”, eventually changed their mind and developed Gibson Les Paul in 1950. The urge to catch up with rising craze towards solid-body electric guitars contributed to creating the line that maintains its fame till this day. In 1954, Leo Fender, along with George Fullerton and Freddie Tavares designed the Stratocaster. This was, once again, a revolutionary guitar since it had the features that were not available on its predecessors. It had double cutaway in the upper bout of the body, it had the vibrato system that relied on the string tension (though it was marketed as tremolo), and three pickups that could be selected using a three-way switch. 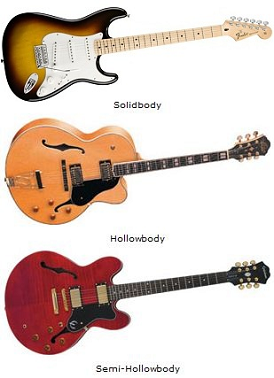 This period marks several significant models of electric guitars. Eddie Van Halen’s Frankenstrat was a sort of combination between Fender and Gibson. It had humbucker bridge pickups paired with the single-coil neck pickup, though the latter was never wired and was shoved in there for design purposes. This guitar was created for faster, rhythmic playing and every part is built with that in mind. It has slimmer body and neck, pioneering high output pickups and floating tremolo devices. With Jackson Randy Rhoads in 1984, which had V shaped body and Ibanez 7-string Guitar in 1994 the world of electric guitars was changed once again. Introducing the 7th string, Ibanez popularized extreme low-end and contributed to developing other extended range electric guitars. Electric guitars have undergone multiple significant changes before they acquired the design and circuitry they have today. The road of its development was filled with failures and successes, but the result we have today is undoubtedly worth all the trouble. I cannot even imagine the modern music without electric guitars. And it was made possible thanks to the genius minds that laid foundation for evolutionary forces. We can praise them interminably and hopefully we will till the end our days. We shall see!